Visit us for a complimentary, no obligation Hair Check. A qualified hair loss consultant will analyse your scalp and hair to determine your current condition and suggest the best course of treatment for you. Although over 40% of men begin to lose hair in their early 20s it doesn’t mean thinning hair or baldness is inevitable. What is important is early identification of the hair loss problem, and that’s where a complimentary no obligation Advanced Hair Check can really help. If you’re worried about male pattern baldness, the first thing to do is visit Advanced Hair for a complimentary, no obligation male hair loss check. 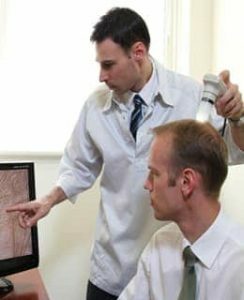 A qualified consultant will analyse your scalp and hair loss to determine if you are experiencing any of the early signs of clinical male pattern baldness. Then you can decide what you want to do about it and which Advanced Hair Studio procedure is right for you. Send us your details, and we will organise a time for your complimentary Hair Check at your closest Advanced Hair Studio. Can Baldness and Thinning Be Treated? Male hair loss affects more than 40% of men in their early twenties, but that doesn’t mean you can’t fight it. Male Pattern Baldness can be addressed if you act quickly. Send us your details using the online application form for your complimentary no obligation hair check. Once the Hair Check is completed, you will have all of the information necessary to allow you to decide which Advanced Hair Studio treatment is right to help you tackle Male Pattern Hair Loss. Strand-by-Strand: Our Strand-by-Strand treatment creates a natural form of hair restoration by replacing your hair the way it fell out – strand-by-strand. It looks natural from every angle, and we’ve had a 100% success rate with this procedure. Laser Therapy: Our Laser Therapy addresses your scalp health to promote hair growth and improve the health of your follicles. We use sophisticated laser technology that is FDA-approved. Advanced Hair Fibres – Thickening Fibres: We bond natural Keratin fibres to your hair to make it look instantly thicker. It also looks natural, and the strength of the fibres means the strands stay in place in all conditions. Advanced Singular Hair Grafting: Reverse the effects of hair loss with our celebrated grafting technique. Men seem to think that going bald is just part of ageing. In truth, it is a medical condition, and it can be treated. While hair loss is a superficial condition, it can affect confidence and your overall health. If you lose confidence in your appearance, you can lose confidence in other areas of your life. You may begin to avoid social situations, you could withdraw from personal relationships, and you may lose the confidence you need to exceed in your profession. By getting your hair loss treated, you’ll feel better about yourself, and that will extend into every facet of your life.